If you're looking for a mild lift for just the rear of your truck, you've come to the right place! Ready Lift rear lift kits are an easy solution that is easy to install, safe to use, and best of all, maintain factory ride quality, quaranteed. 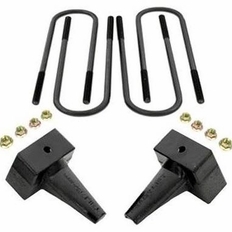 This ReadyLift rear lift kit achieves lift for your truck with a pair of coated lift blocks, new longer coated U-bolts, and all necessary hardware. The cast iron design is guaranteed never to break or fail, unlike some cheap competitors parts of lesser quality. This simple solution means you won't have to compress your springs, and you can probably to the installation yourself in your own garage. Your ReadyLift rear lift kit will come with everything you need for a quick and easy installation. All necessary hardware, as well as detailed instructions that include photos, and a Lifetime Warranty are included. The part number for this Ready Lift rear lift block kit is 66-2195 and it fits 1999-2010 Ford F250 and F350 Super Duty (No Dually) 3" Lift. You will receive 5" blocks that replace the existing 2" blocks, meaning your truck will sit 3" higher in the rear. We Guarantee the lowest out the door price on Ready Lift Kits. If you find the same Ready Lift part number for sale somewhere else for a lower out the door price, we will match or beat the price. Keep in mind that our shipping is free when comparing prices and we keep an extensive stock (these things are heavy!). Most items ship the same business day! Simply give us a call at 866-639-5385 during regular business hours and direct us to where we can see the better Ready Lift price. We think our prices on Our Ready Lift Kits are very competitive, but if you think you've found a better deal, we want to know!